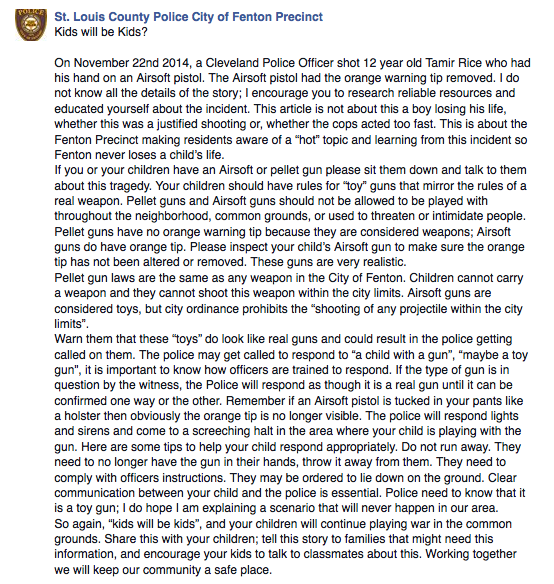 St. Louis County police, Tamir Rice: Facebook post warns parents not to let kids play with pellet guns. The message warns that children playing with toy guns may encounter police who use “lights and sirens and come to a screeching halt” and that parents should prepare them to throw their gun down and lie on the ground according to officers’ instructions. While the post doesn’t defend Cleveland officer Tim Loehmann for killing Rice, the decision to cite a dead child in the course of communicating with residents who may already believe that their local officers use dangerous and excessive levels of force might be said to be a questionable one. The St. Louis County Police brass seem to agree; the post appears to have been deleted and a spokesman told a Guardian reporter the department is “trying to figure out” who wrote it. 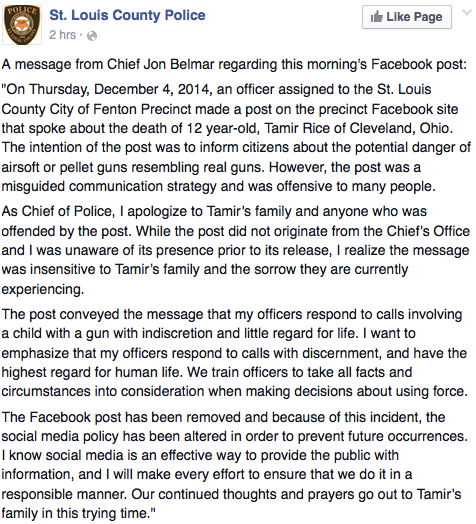 The @stlcountypd tweet/FB post on Tamir Rice was written by police officer Aaron Dilks, he tells me. I asked if he regretted it. He hung up. Update, 4:45 p.m.: St. Louis County Police Chief Jon Belmar has apologized for the message.